Evidence of a ninth planet: Caltech’s Konstantin Batygin, an assistant professor of planetary science, and Mike Brown, the Richard and Barbara Rosenberg Professor of Planetary Astronomy, discuss new research that provides evidence of a giant planet tracing a bizarre, highly elongated orbit in the outer solar system. The new research published in The Astronomical Journal with an article titled Evidence For A Distant Giant Planet In The Solar System. The writers of the article are Caltech (California Institute of Technology) astronomers Konstantin Batygin and Michael E. Brown. Yes, the Same Mike Brown who discovered Eris in 2005 (from images taken on October 21, 2003), the second-biggest dwarf planet (so far) after Pluto. Mike Brown is known as the “Pluto Killer”. In fact, as objects increasingly closer in size to Pluto were discovered in the region, it was already being argued that Pluto should be reclassified as one of the Kuiper belt objects. But the discovery of Eris was the last impact: it led the International Astronomical Union (IAU) to define the term “planet” formally for the first time the following year. (1) This definition excluded Pluto and reclassified it as a member of the new “dwarf planet” category (and specifically as a plutoid). Interestingly, they have had started their research to demonstrate that there’s no ninth planet: it was first proposed in 2014, and it has been the job of Konstantin Batygin and Michael Brown, the scientists in the Division of Geological and Planetary Science at the Caltech, to essentially debunk it. But they reached the exact opposite. Batygin told Nature that “we have a gravitational signature of a giant planet in the outer Solar System”. The researchers did not observe the planet directly, they merely put together a mathematical model that infers its existence. According to Batygin, they have enough gravitational signature of a giant planet in the outer solar system. The interesting thing is, the scientists claim that some of the most powerful telescopes on Earth probably be capable of spotting it. It can be hiding in some of the photographs taken already by these telescopes and soon be discovered. Size comparison of the Ninth Planet against the Earth and Neptune. It is smaller than Neptune, but likely bigger than the Earth. The orbit of the ninth planet. It has 20,000 years of orbital period. It is 60 billion miles from the Sun. 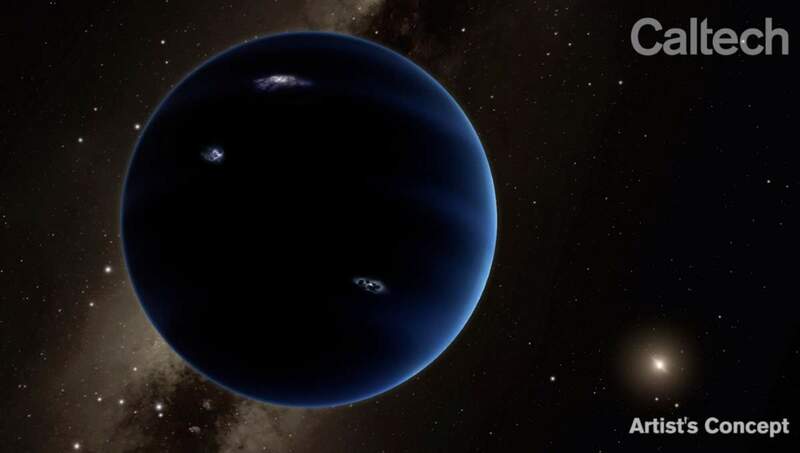 If this ninth planet exists, and probably it does, the researchers suspects it’s 10 times the mass of Earth (for comparison, Neptune has 17 times as much mass compared to the Earth) and 200 times farther from the sun. At that distance, it would take the planet between 10,000 to 20,000 Earth years to complete one trip around the sun. Pluto, for comparison, takes 248 years to complete its orbit. At that distance, the possibility for life is near to none. On the surface (if there is a surface, of course), the Sun will be just a brighter star. The ninth planet is likely a desolate ice ball with a gassy outer layer, like Neptune. Brown is confident that the ninth planet does exist. He tweeted that “OK, OK, I am now willing to admit: I DO believe that the solar system has nine planets”. Mike Brown’s (AKA the Pluto Killer) tweet about the ninth planet. Pluto fails to meet the third condition, because its mass is only 0.07 times that of the mass of the other objects in its orbit (Earth’s mass, by contrast, is 1.7 million times the remaining mass in its own orbit). The IAU further decided that bodies that, like Pluto, meet criteria 1 and 2 but do not meet criterion 3 would be called dwarf planets. On September 13, 2006, the IAU included Pluto, and Eris and its moon Dysnomia, in their Minor Planet Catalogue, giving them the official minor planet designations “(134340) Pluto”, “(136199) Eris”, and “(136199) Eris I Dysnomia”. Had Pluto been included upon its discovery in 1930, it would have likely been designated 1164, following 1163 Saga, which was discovered a month earlier.